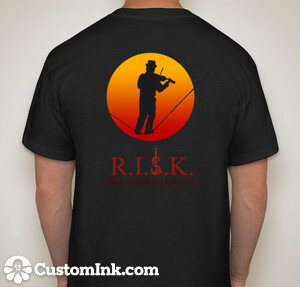 RISK: The New RISK T-shirt is now available! 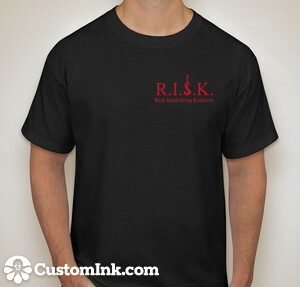 We are excited to announce that the new RISK T-shirts are ready to order, and they turned out great! Shirts can be ordered directly from Shane by telling him what quantities and sizes you want, or you can place your order online here: http://www.customink.com/signup/1s7svmrs. Either way, give a check or cash to Shane for the total amount. Shirts cost $18, the whole range of sizes from ultra small youth to ultra large adult are available. Support the Rock Island String Kollective, order shirts for the your friends and neighbors this holiday season!